While climbing on the success ladder, it has become increasingly important for us to deliver precisely tested and high grade assortment of PP,PVC Label Removing Machine from PET plastic bottles. 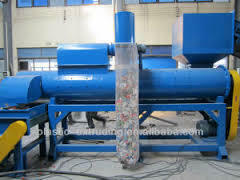 The offered machine can remove PVC label from Maza,Slice recycling PET bottle . Our offered machine is manufactured by making use of optimum grade components under the visionary guidance of trained professionals as per the set industry norms. Clients can avail this machine from us at market leading price. Engaged in offering efficiency based instruments, our range of products assures our clients of better output. Easy to operate, our metal detectors & electronic instruments require less maintenance and are available at competitive prices. With their superior features, our products like metal detector, RPM indicators, digital RPM indicators and industrial RPM indicators have created a niche for themselves and are used in industries like: pharma/ chemical, food processing industries/ exporters, textile, rubber, food products, PVC film/ plastic/ fiber.